Join us for our Third annual Western Art & Wine Auction! There will be both live and silent auctions and lots of fine wine. Preview and social hour starting at 6:30PM and bidding at 7:00PM. All artwork has been donated and all proceeds will be used to help support educational programs and publications at the Museum of the Mountain Man / Sublette County Historical Society. To view an example of the artwork that was featured in last year’s auction, check out the 2018 Western Art & Wine Catalog! This is a free event with open seating, if you wish to reserve seating for your group, please call 307-367-4101. In person Bids – Bidders can register at the auction. All sales are final the night of the auction in “as is” condition and must be paid for and taken the night of the auction unless otherwise arranged. Call in Bids- Register to bid by phone, we will call you during the live auction to submit your bids via phone. Absentee Bids – If you are unable to attend the auction, you may leave an absentee bid. This is a confidential, written maximum price for the lot or lots in which you are interested. The highest absentee bid on each lot will be the starting bid at the live auction. Absentee bids must be received by noon on July 12, 2017. Register for the auction and submit bids by calling 307-367-4101 or emailing artauction@mmmuseum.com and provide name, address, phone and email. Winning absentee bidders will be contacted by July 13th, 2017 and must provide payment within 5 days of being contacted. Shipping – Shipping can be arranged for an additional charge. Terms & Conditions – Cash, bankable check, and credit cards accepted. FULL payment due and payable at the time of sale. All items must be removed from sale site the day of sale unless other arrangements are made. We reserve the right to add or delete items, all items are subject to change. Announcments at the sale take precedence over printed material. Be sure to pre-inspect. All determinations are up to the bidder/buyer. Your bid is a legally binding contract. 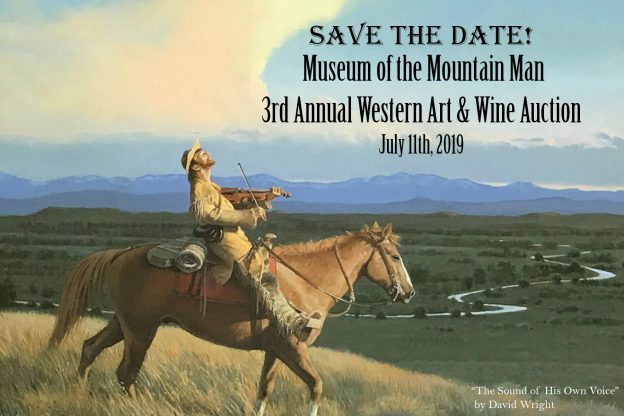 For more information about the 2019 Western Art & Wine Auction, contact Sandy Smith, Art Auction Organizer, at the Museum of the Mountain Man, 307-367-4101, PO Box 909, 700 East Hennick St., Pinedale, WY 82941, or email artauction@mmmuseum.com.